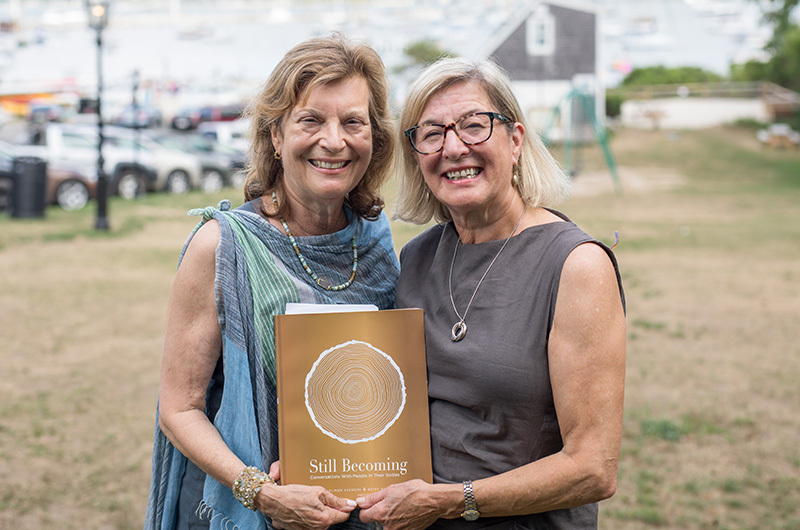 Elinor Svenson and Betsy Banks Epstein, editors of Still Becoming. For sisters-in-law Betsy Banks Epstein and Elinor Svenson, turning 60 meant settling down, taking up new hobbies, spending time with family, and maybe a few extra trips to the doctor’s office. But it also meant something else: the opportunity to think deeply about the slightly scary, possibly exciting next chapter in their lives, and what they could learn from the lives of other sexagenarians around them. That opportunity turned into a book called Still Becoming: Conversations With People in Their Sixties. On Friday there was a book reception at the Simon Gallery in Vineyard Haven. Ms. Svenson, a psychologist, and Ms. Epstein, a freelance writer, talked to nearly 25 individuals and a handful of couples about their lives at the liminal transition between seniority in the workspace and senior discounts at the movie theatre that a 60th birthday brings. When she turned 59, Ms. Svenson lost her husband. She recruited her sister-in-law, Ms. Epstein, to help put people’s stories on paper, and the two came up with a list of potential subjects. Rather than just transcribing the interviews, Ms. Svenson and Ms. Epstein used writing and photography to create a sense of intimacy, coherence and unity between each of their subjects. They asked open-ended questions such as, “How do you see yourself at this time in your life?” that led to broader conversations about aging, family, love, loss and remembrance. Ms. Epstein said that many of the people in their 20s and 30s who have read the book expressed excitement about getting to a stage in life when learned experience and wisdom can help mitigate some of the stressors they’ve dealt with for much of early adulthood. “This book doesn’t just apply for when you are hitting 60, but when you are moving into that next chapter, whatever that chapter is,” Ms. Svenson said. For Ms. Epstein and Ms. Svenson, that next chapter is the particular challenge of being 60 in 2018. It’s a challenge for which they feel ready.